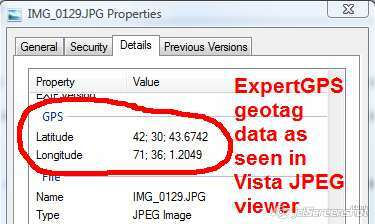 Geotagging: How do I Write GPS Info into the EXIF Metadata of my JPEG Digital Photos? I am purchasing the new Garmin eTrex Vista H for the principle purpose of determining my Long/Lat and Altitude while taking photos on my Nikon D80, a camera that cannot support an internal GPS. I am not involved in GeoCaching. Does your software support transfer of the EXIF Data from the GPS to the JPEGs once the .jpg files are downloaded to a folder on my PC [Vista OS]? I do assume that the date and time of the GPS and the camera needs to be in reasonable sync. Your web site is not clear on this point. Yes, ExpertGPS is designed to geotag your digital photos by matching the timestamps on your photos with timestamps in your Garmin or Magellan GPS receiver’s GPS tracklog. Once the photos are synchronized in ExpertGPS, the software calculates the exact latitude and longitude where you took the photo, and writes that geotagging information back into the EXIF metadata of the JPEG file itself. ExpertGPS also lets you edit or add other EXIF metadata tags: Title, Description, Keywords, and the City, State, Country location tags. ExpertGPS changes your JPEG metadata (without changing or degrading the quality of your JPEG image) according to the EXIF standard, so that the latitude, longitude, timestamp, and keyword metadata are accessible in any other EXIF-aware application. The screen capture above shows the latitude and longitude GPS data (in degrees, minutes, and seconds) for a photo I geotagged with ExpertGPS last year. I’m viewing the JPEG properties in Windows Vista (I right-clicked the photo and clicked Properties). This EXIF lat/lon information will be used in online photo sharing sites like Flickr. ExpertGPS-geotagged photos will automatically be placed on a map when you upload them to Flickr.